In Pull up a Log Editor-in-Chief Noel Chidwick rightly notes the achievement of the magazine reaching its tenth edition. There are Judge’s Reports by Eric Brown and Pippa Goldsmith on Shoreline’s flash fiction competition followed by a celebration of The Worthy Winners and shortlisteesb. Three of these stories appear in this edition (see *.) Tales From the Beachcomber riffs on the human fascination with powers of ten via the life and works of Arthur C Clarke, there’s an interview with Helen Sedgwick by Pippa Goldschmidtc, in Noise and Sparks: The Company of Bears, Ruth E J Booth lauds the interactions and memories convention going brings, the tolerance it fosters. 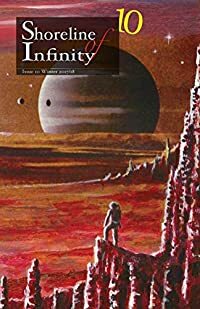 Reviewsd considers Ada Palmer’s Too Like the Lightning, the Jonathan Strahan edited Infinity Wars, Kim Stanley Robinson’s New York 2140, The Death and Life of Schneider Wrack by Nate Crowley, 2084 edited by George Sandison, and The Clockwork Dynasty: A Novel by Daniel H Wilson. Multiverse has poems by Rachel Plummer, Jo-Ella Sarich and Rosemary Badcoe. Parabolic Puzzlese challenges the reader to identify twelve SF writers from their photographs and very brief information about them. Little Freedoms by Ephiny Gale1 is set in a closed room where some sort of endurance test of nine characters is taking place with various tasks to be undertaken – such as not touching, not speaking, not breathing. The winner gains freedom (from an unspecified but clearly onerous existence.) The others are restored to their former state. Sweet Compulsion by Chris Bailey is told to us rather than shown and overall feels more like a sketch of a story than the complete article. Riddled with quotations from Paradise Lost it features a world in which people’s thoughts are etched onto others’ skins. In Junk Medicine2 by Die Booth plastic ownership is outlawed but there are still people willing to pay over the odds for items made from it. This story does for plastic what Number Ten Q Street did for real food. ATU334 The Wise*3 by Marija Smits is a future tale of Baba Yaga and an importuner, the titular ATU334. If Thine Eyes Offend Thee4 by Daniel Rosen is narrated by Elsa whose ambition was always to be a mermaid. We see the lengths of body reconstruction and skulduggery she will go to to win the Miss Cosmos competition. Pauline and the Bahnians*5 by S K Farrell is set on a demilitarised outpost turned into a – possibly illegal – smallholding. Its weapons are still there though. The narrator of The Apple Bee6 by K E McPhee is marooned on an island on a mostly water planet, with no communication with the rest of humanity and only potatoes, apples and corn as a food supply. Don’t Speak; Don’t Listen7 by Serena Johe explores the ramifications of an implant that prevents the speaker insulting or denigrating anyone. A Choice for the Golden Age* by Matthew Castle was the overall winner of the flash fiction competition. It’s set on a generation starship which rotates its crew (and holds its genetic cargo permanently) in suspended animation.